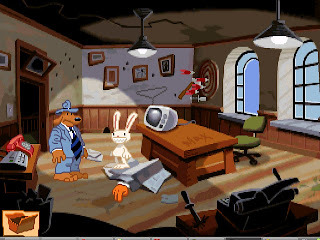 Sam & Max Hit the Road is a graphic adventure computer game released by LucasArts in 1993. 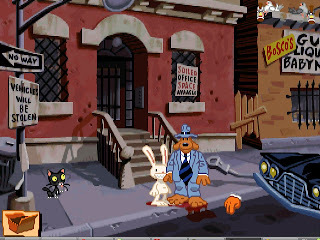 The game is based on the comic characters of Sam and Max, a dog and a rabbit. The characters, created by Steve Purcell, originally debuted in a 1987 comic book series. 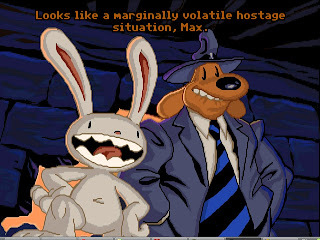 Sam and Max Hit the Road is one of the best adventure game from Lucasarts. 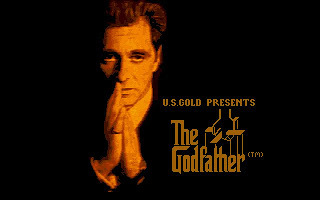 Its humor, voice acting, graphics, music and gameplay are just superb! 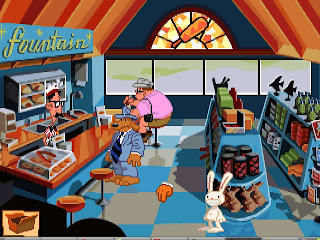 As with other adventure games by Lucasarts in the same time, Sam & Max Hit the Road uses the user-friendly point-and-click system. As usual, there is an inventory system to keep the things we collect for later uses.As with other LucasArts games, we will not die in Sam & Max Hit the Road. 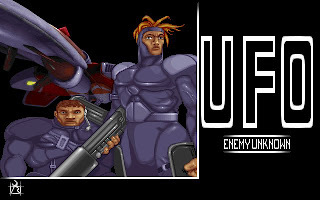 When the game start, Sam and Max receive a telephone call from an unseen and unheard Commissioner, who tells them to go to a nearby carnival. At the carnival, they are told by the owners that their star attraction, a frozen bigfoot called Bruno, has been set free and fled taking their second attraction, Trixie the Giraffe-Necked Girl. Sam and Max set off to find Bruno and Trixie and bring them back. As the duo investigate the carnival, they learn that Bruno and Trixie are in love and that Trixie freed Bruno. Sam & Max leave the carnival to pursue leads at various tourist traps throughout the country, such as The World's Largest Ball of Twine, a vortex controlled by giant subterranean magnets and bungee jumping facilities at Mount Rushmore. The pair learn that two other bigfoots used as tourist attractions in other parts of the country have been freed by Bruno, and that Bruno has been captured by Liverpudlian country western singer Conroy Bumpus, a cruel animal abuser who wishes to use Bruno in his performances. Sam and Max travel to Bumpus' home and rescue Bruno and Trixie, but Bruno then departs with Trixie to join a bigfoot gathering at an inn in Nevada. Following them, Sam and Max are forced to disguise themselves as a bigfoot to enter the party. Eventually the party is gatecrashed by Conroy Bumpus and his henchman Lee Harvey, who hope to capture the bigfoots. However, Sam manages to fool Bumpus and Harvey into donning their bigfoot disguise, and Max locks them in the inn's kitchen freezer. Chief Vanuatu, leader of the bigfoots, in recognition of the pair's actions, makes the Freelance Police members of the bigfoot tribe and tells them of a spell that will make the world safe for bigfoots again, preventing their capture by humans. 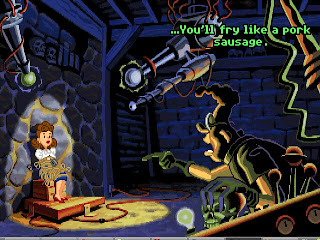 However, the chief requires help deciphering the spell's four ingredients, and asks for Sam and Max's help. Eventually, they discover that the ingredients are a vegetable resembling John Muir, hair restoration tonic, the tooth of a dinosaur and a vortex contained within a snow globe. Combined with a live bigfoot sacrifice—which Max substitutes for frozen bigfoot-clad Bumpus and Harvey—the ingredients cause large trees to spring into existence, destroying towns and cities and covering the bulk of the west United States in forest. Content that their work is done, Sam and Max take the frozen ice block containing Bumpus and Harvey to the carnival. 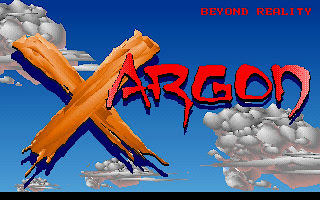 Believing that Bruno has been returned to them, the owners give a large reward of skee ball tickets to the Freelance Police, who then spend the end credits shooting targets at a carnival stall with real firearms. 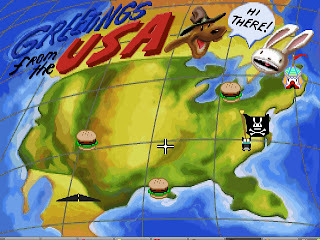 In conclusion, Sam & Max Hit the Road is an adventure game that you cannot miss. 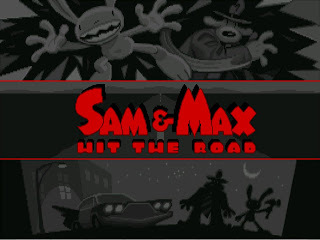 You can download Sam & Max Hit the Road here. 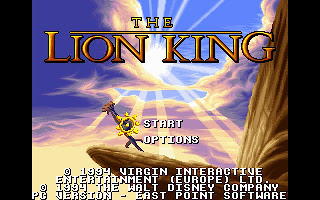 You will need ScummVM to run the game.